Experience the thrill of a Lakeland or Scottish winter! Whether we are crunching over frozen, snow-covered tops that are reflected in the lakes far below, or making progress with heads bowed against the remnants of an Atlantic gale, we can be sure of an exhilarating adventure during the short winter days on the fells. We will raise your awareness of the hazards on wintry hills, introduce you to the correct equipment, and teach you the skills to travel safely in this exciting environment. 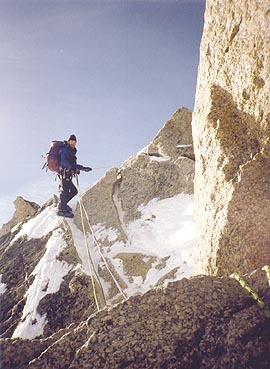 We will make best use of the prevailing conditions, and where possible, practice ice axe and crampon skills and basic rope work, including the use of a rope as a navigation and walking aid. The best winter conditions come in short bursts in Britain, and the Lake District is handy for short breaks. We also travel to Scotland for many of our winter activities. We cover a wide spectra of difficulty from beginner to expert, so whether it is your first time or one of many, we can cater to your particular needs or desires. Our clients range from young to old and from low to high fitness, and neither age or physical condition are barriers to an enjoyable holiday with Go Higher. We have found that the most important factor in you achieving your goals is self-confidence, which we believe we can enhance. As a general guide, you will need to be of at least average fitness and be willing and able to cope with often very cold and inclement conditions. local transport to and from the activity (but see specific courses and holidays for exclusions - e.g. airfares). Also check the conditions for your chosen course or holiday, as requirements vary for each course/holiday. Traversing the Aonoch Eagach Ridge (Scotland) with Ben Nevis in the background. Photo © Go Higher. 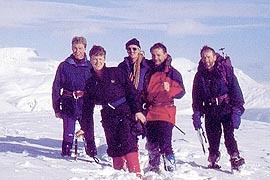 Cairngorm descent. Photo © Go Higher.